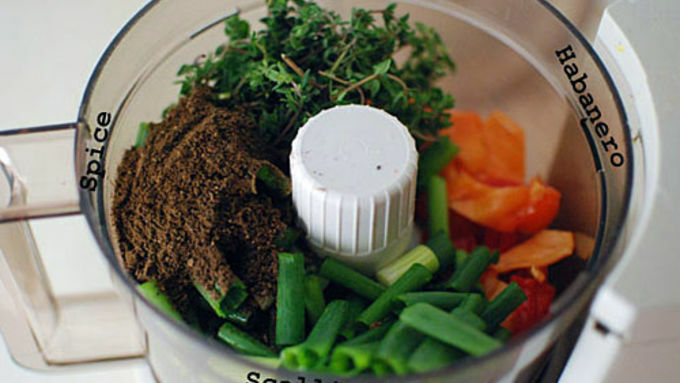 Place the habaneros, green onions, spices, and thyme in the food processor. 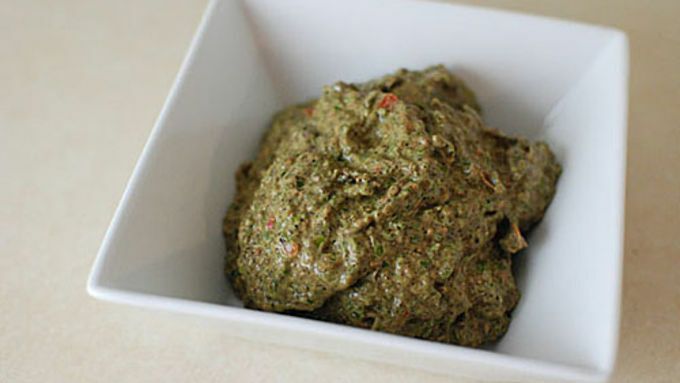 Add 1-2 tablespoons olive oil and make a paste. This is a simplified jerk chicken rub. Note: be sure to take the seeds out of the habaneros if you can't take the heat! If you take out the seeds, this recipe will be medium heat, but if you leave them in it will be very hot. Heat 2-3 tablespoons olive oil in a skillet over medium-high heat. Brown the chicken on all sides in 2 batches and remove chicken from pan. Add carrots, onion, and celery to pan and saute for 3 minutes. Add garlic and cook 1 minute more. Add flour and stir to mix in well, lowering heat to medium if necessary. Cook 1 minute while stirring. Add the jerk paste and mix. Cook 1 minute more. Add the vinegar, beer and water to the pan and scrape the bottom of the pan to incorporate any browned bits into the sauce. Add the chicken and potatoes. Simmer for an hour until potatoes are tender. Serve over rice. Jamaican jerk chicken is a recipe I have always shied away from making. It seemed like a big production with millions of spices – many that I was not familiar cooking with. After years of avoidance, I finally checked out a few recipes and realized that it wasn't so bad after all! It even features many of the flavors I have been loving lately in my kitchen, particularly allspice and habanero. Allspice is an interesting species. Most people think it is a mixture of spices, but it is actually a dried fruit, just like black pepper. The flavor is somewhere between cinnamon, cardamom, and pepper. 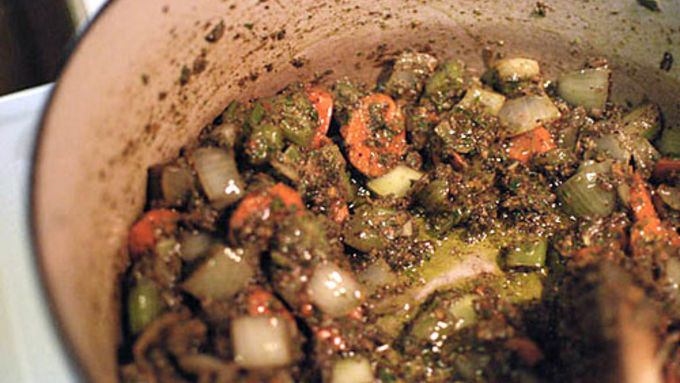 When featured in a stew like this, allspice adds a deep dark and savory aroma and taste. Feel free to use ground spices in the same amounts shown in the recipe. If you are using whole spices, use 3 tablespoons of allspice instead of 2, and for the rest, make sure to heap on the measurements. This is the simplified jerk chicken rub minus the wet ingredients. At this point, you could also add a swig of vinegar and beer or rum and have a killer jerk chicken marinade. Instead, I went the stew route. First brown the chicken on all sides. Chicken legs are 10 times better than breasts in this recipe. After the chicken comes out, vegetables go in, followed by flour. 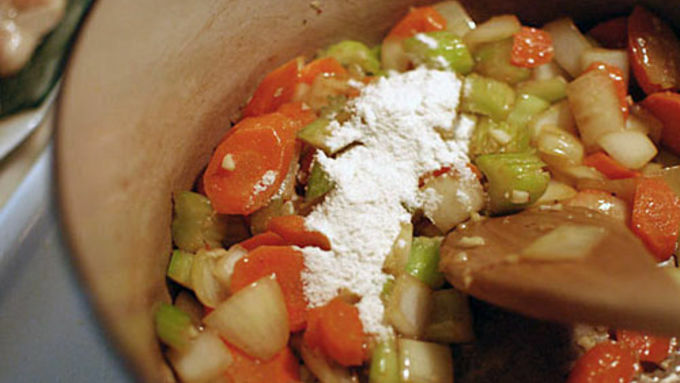 The flour gets incorporated with the fat to thicken the stew. Paste goes in next. The chicken is added back in with some vinegar and beer. Yum! This looks and smells good enough to eat now, but refrain from tasting – there is undercooked chicken in there! ?Some chicken stock and sweet potatoes finish it off. Let this simmer about an hour and you will have a huge pot of amazing goodness. 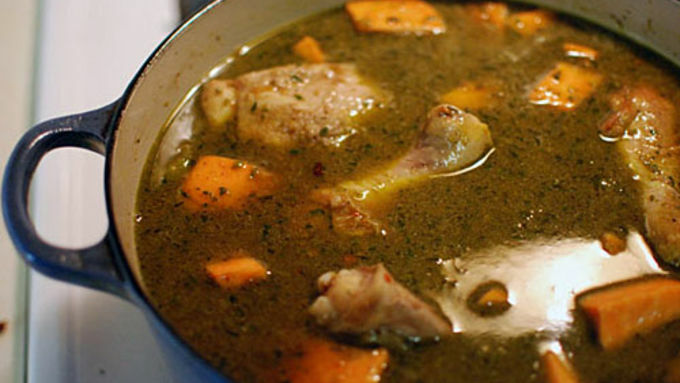 It tastes a bit like jerk chicken, and a bit like dinner at Grandma’s! 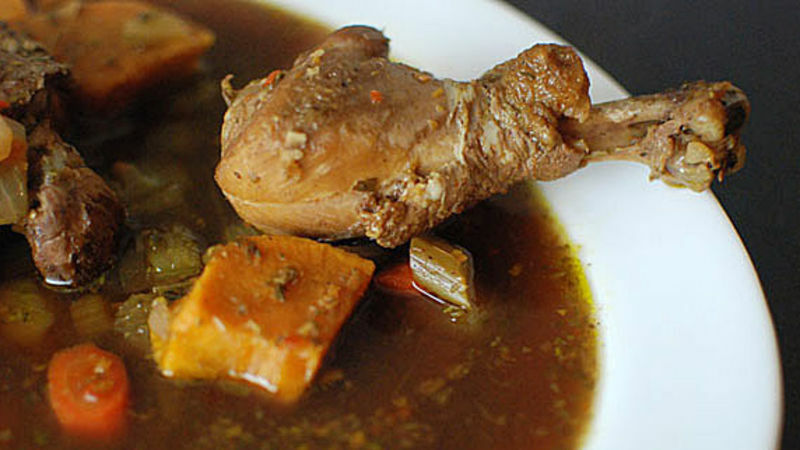 An interesting mix that is as much comfort food as it is spicy and exotic.